MOSCOW, January 31. /TASS/. Russian carrier rockets will launch three Progress MS resupply ships and three Soyuz MS manned spacecraft with new crews from the Baikonur Cosmodrome to the International Space Station (ISS) this year, a source in the domestic space industry told TASS on Thursday. "Pursuant to the schedule of launches to the ISS for this year, which Roscosmos [State Space Corporation] is due to approve, three Progress MS resupply ships and three Soyuz MS spacecraft are planned to be launched," the source said. Roscosmos Executive Director for Manned Programs Sergei Krikalyov earlier told TASS that the Russian space agency might consider and approve the schedule of flights to the orbital outpost this year before the start of February. The first launch this year will be unrelated to the ISS: a Soyuz-2.1b carrier rocket will blast off from the Baikonur Cosmodrome with the EgyptSat-A Earth’s remote sensing satellite, which Russia’s Energia Space Rocket Corporation has developed instead of the EgyptSat-2 vehicle that went out of order in 2015, the source said. 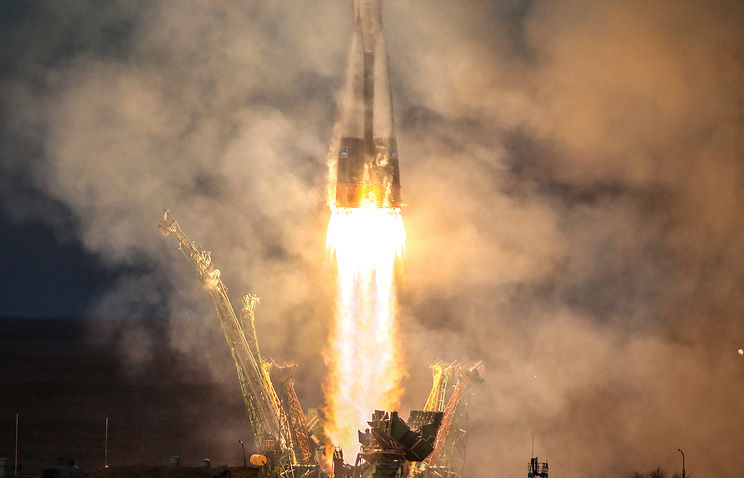 After this, the first manned launch to the ISS is planned for March 14: a Soyuz-FG carrier rocket will deliver a Soyuz MS-12 spacecraft with Roscosmos cosmonaut Alexei Ovchinin and NASA astronauts Nick Hague and Christina Koch to the world’s sole orbiter. Ovchinin and Hague were expected to arrive at the space station back in October 2018 but they were unable to fly to the ISS due to the aborted launch of a Soyuz-FG carrier rocket. Roscosmos Chief Dmitry Rogozin earlier said that the first manned launch to the orbital outpost in 2019 planned for March 1 might be rescheduled for early April so that the Russian space agency could fulfil its contractual obligations before its other partners, including from the United Arab Emirates whose first cosmonaut is due to travel to the ISS this year. Next in the schedule is the launch of a Soyuz-2.1a carrier rocket with a Progress MS-11 resupply ship whose blastoff is planned for April 4. After that, a manned Soyuz MS-13 spacecraft is scheduled to be launched by a Soyuz-FG carrier rocket on July 6. The launch of a Progress MS-12 resupply ship aboard a Soyuz-2.1a carrier rocket is planned for July 31. On September 25, the launch of a Soyuz-FG rocket with a manned Soyuz MS-14 spacecraft is scheduled after an almost two-month break. The launch of a Progress MS-13 cargo ship aboard a Soyuz 2.1a carrier rocket will wrap up the program of flights to the ISS this year, the source said. Russia’s State Space Corporation Roscosmos did not comment on this information.